At least the Huracan Performante has a fancy aerodynamics system it can eat McLaren's dust with. Nurburgring lap records are replaced so often you’d be forgiven for thinking they were cheap underwear. 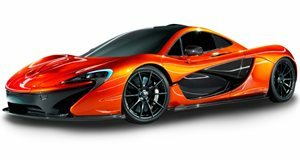 That doesn’t make them any less impressive, especially when McLaren’s latest record attempt effectively dethrones the Lamborghini Huracan Performante and rockets the British automaker to the top with its new claim as the fastest production road car to lap the Green Hell. Lamborghini fans, you may want to avert your eyes. Not only did the road-legal McLaren P1 LM beat the Huracan Performante, it utterly shattered it. While the Huracan crossed the finish line with an impressive time of 6:52.01, the P1 LM made the Lamborghini appear as if it were going in slow motion when it bested it with a time of 6:43.2. That’s a full 8.81 seconds faster than the Lambo, a metaphorical century by race car standards. Okay, so maybe the fact that the Nurburgring is 12.9 miles long makes it so small advantages are compounded into big lap time differences, but there’s no denying the McLaren has the hardware to pull this feat off. Both cars weigh almost exactly the same and both also feature cutting-edge aerodynamic technology to help them in the corners. But in this case, horsepower is the deciding factor. The Huracan Performante can boast a power rating between 625 and 640 horsepower, but that’s utterly trumped by the P1 LM’s 996 horsepower coming from a twin-turbo V8 and supplemental hybrid electric system. Most impressive? Right after making history, the P1 LM got right back on the highway and drove home to the UK. It’s such a shame that only five will ever be built, but we’re sure the customers in the US, Japan, UK, and UAE will be ecstatic with this news.